Is it time for the Fed to raise its policy rate? What would happen if the Fed was to adopt a different policy rule--one that entailed an immediate increase in its policy rate? The effect of such a policy change in the OLG model I studied here would be to raise the real interest rate and contract the level of output. The great contraction of 2008 pushed the U.S. economy into a protracted liquidity trap (i.e., a long period with zero nominal interest rates and inflationary expectations below target). In addition, the recovery was jobless (i.e., output growth recovered but unemployment lingered). This paper presents a model that captures these three facts. The key elements of the model are downward nominal wage rigidity, a Taylor-type interest-rate feedback rule, the zero bound on nominal rates, and a confidence shock. Lack-of-confidence shocks play a central role in generating jobless recoveries, for fundamental shocks, such as disturbances to the natural rate, are shown to generate recessions featuring recoveries with job growth. The paper considers a monetary policy that can lift the economy out of the slump. Specifically, it shows that raising the nominal interest rate to its intended target for an extended period of time, rather than exacerbating the recession as conventional wisdom would have it, can boost inflationary expectations and thereby foster employment. I highlighted the policy conclusion in blue because I find it interesting and because it is likely to be controversial. In what follows, I discuss their model and conclusions. I hope that some readers more familiar with this literature than myself might want to comment. where 0 < β < 1. Each agent has a unit of time which they are willing to supply as labor at any wage (since they derive no disutility from labor here). Firms hire labor at a competitive wage, and remit any profit to shareholders (the representative agent). There is a single asset--a risk free nominal government bond. The government makes no purchases and has a lump-sum tax that it uses to finance the interest cost of its debt. where gt+1 denotes the (gross) rate of growth of real GDP. One way to interpret the Fisher equation is that it represents a no-arbitrage-condition that must hold between real and nominal debt with identical risk characteristics (their real rates of return must be the same, if both instruments are to be willingly held in the wealth portfolios of individuals). Suppose that the economy is always at full employment, so yt = y* and that growth is zero (gt = 1). Later on, I will follow the authors and add a nominal wage rigidity, but for now what I have to say is independent of full employment equilibrium. Now, I'm not sure about you, but where I grew up we'd say that the stability condition here (for monotone dynamics) is 0 < αβ < 1. If this is the case, then inflation converges monotonically to the inflation target Π* from any given initial inflation rate. The only "problem" here is that the initial inflation rate is not determined. Consequently, there is a continuum of inflation paths consistent with equilibrium. And, since there are multiple equilibria, I guess this opens the door for extraneous inflation rate shocks (what the authors call "confidence shocks")? Is there some way for policy to eliminate the potential instability that induced by this indeterminacy? The "solution" to the indeterminacy problem seems weird (to me). The basic idea goes like this. Suppose that the policy maker sets α > 1/β (so that αβ > 1). Evidently, this is known as the "Taylor Principle," which is the idea that the Fed should respond aggressively to inflation (i.e., increase the interest rate by more than one-for-one with any rise in the inflation rate). But wait a second -- doesn't αβ > 1 imply that the steady state equilibrium is unstable? Yes. But suppose we restrict attention to inflation trajectories that remain within a bounded neighborhood of the steady state? Alright, let's suppose. Well then, if αβ > 1, then the only equilibrium trajectory that remains within that neighborhood is the steady state itself. In other words, the steady state is the locally unique equilibrium. In contrast, if αβ < 1, there are multiple equilibrium inflation trajectories within a given neighborhood (that converge to the steady state). What justifies restricting attention to equilibria that are locally unique in the sense defined above? Beats me. From a global perspective, if α > 1/β, then it seems that a hyperinflation dynamic is possible if the initial inflation rate starts above the steady state Π*. (Evidently, Eduardo Loyo uses just such a case to interpret the Brazilian hyperinflation; see Tight Money Policy on the Loose: A Fiscalist Hyperinflation.) And as Benhabib, Schmitt-Grohe, and Uribe 2001 demonstrate, if there is a zero-lower-bound (ZLB) on the interest rate, then there exists a second steady state -- a liquidity trap equilibrium. Moreover, for any initial inflation rate below Π*, inflation converges to the liquidity trap equilibrium (zero nominal interest rate and deflation). The following diagram summarizes these ideas. The diagram is plotted in (R,Π) space (sorry, but P = Π in the diagram -- could not find the Greek letters in Coreldraw). 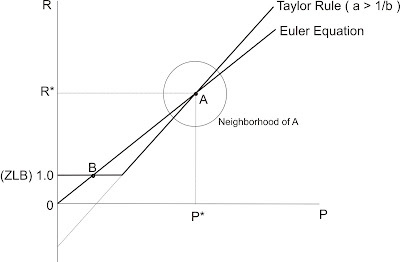 The Euler equation is from ; i.e., R = (1/b)P. The Taylor Rule is from  with a ZLB (R ≥ 1) imposed, and with α > 1/β ( a > 1/b). Point A denotes the "intended" steady state and point B denotes the "unintended" steady state, where the net nominal interest rate is zero, and inflation is below target. Start with an inflation rate close to but below target. 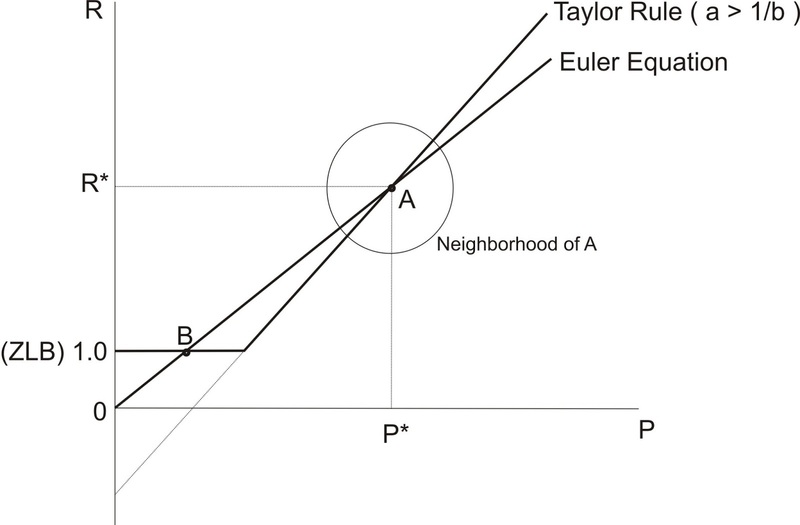 Then trace your pencil up to the Taylor Rule line--this is the policy rate associated with the initial inflation rate. Now ask: at this policy rate, what does the Euler Equation imply about the expected (one period ahead) inflation rate? Move your pencil from left to right until it hits the Euler Equation line, then project down on the P-axis. The next period inflation rate is lower than the initial inflation rate. The economy heads toward the liquidity trap equilibrium, point B. But so what if the economy gets stuck at point B? In the model economy, the liquidity trap equilibrium is consistent with full employment, with nominal variables, including the nominal wage rate, declining over time in this equilibrium at the rate of time preference (deflation). with γ(ut) a decreasing function of ut, so that nominal wages are permitted to fall more rapidly as the unemployment rate rises. The fact that γ(0) > β is critical here. It implies that nominal wages cannot fall as fast as the rate of deflation implied by the Friedman rule when the economy is at full employment. Consequently, the liquidity trap equilibrium at point B in the figure above is inconsistent with full employment. That is, the unemployment rate must rise in order to permit the nominal wage to decline fast enough to keep the real wage growing at its long-run "natural" rate of g ( = 1 here). While real wage growth is consistent with a balanced growth path, the level of the real wage is too high (which is what causes firms to demand less than the full employment amount of labor). While real GDP is growing along its balanced growth path, it remains forever below "potential." Many recent papers model the great recession shock as some event that lowers the natural rate of interest (an exogenous increase in β would do the trick). In contrast, the authors here appeal to evidence which suggests that a "confidence shock" -- an exogenous decline in inflation, interacting with the Taylor Rule above, leading to a liquidity trap -- may have been the culprit. Assume that this is the case. Then what can be done? Well, one thing you would not want to do is adopt language suggesting that the Fed is prepared to keep R =1 for an extended period of time. Nor would you want to adopt the Evans Rule (which essentially accomplishes the same thing). These are policies that (in the context of this model) lead agents to expect deflation (or inflation below target) off into the indefinite future. These policies, if anything, reinforce the liquidity trap outcome. What about balance sheet policies? Nope -- this is a "cashless economy." The Fed's balance sheet plays no role in this model. The type of policy that works here entails changing the parameters of the Taylor rule. In particular, instead of α > 1/β, the Fed should set α < 1/β. The effect of this change would be to make the Taylor Rule line in the figure above "flatter" than the Euler Equation line. The equilibrium inflation rate would then eventually rise back to the target rate. (Of course, this opens the door to multiplicity, but what the heck -- at least we get back to full employment eventually.) In other words, the Fed should move to increase its policy rate -- so that inflation expectations (and inflation) will follow. In fact, the authors suggest an extreme form of this policy change: set α = 0 in . The effect of this policy change in the model is for individuals to revise their forecast of inflation immediately to Π*. While nominal wages begin to rise at the rate of inflation, there is a level drop in the real wage as the unemployed are absorbed into the workforce. The economy moves from B to A in the figure above. This policy conclusion has to hinge critically on the manner in which agents are assumed to form expectations. Falling into the liquidity trap appears possible even under an adaptive learning rule; see, e.g., Benhabib, Evans and Honkapohja 2012. But getting out would seem to entail more than a simple adjustment to the Taylor Rule.